Rumors that Greece is making a deal turns out to be false. Depositors in Greece remove more money from the banks. Venezuela and Russia make an economic free zone. IMF gives the green light for the Yuan, it is now ready to become a reserve currency. More states join in to stop the President’s immigration executive order. Senate unlikely to push for the renewal of the Patriot Act, even though the President is pushing for a renewal. Macedonia ready to join the Turkish-Russian pipeline. By the end of 2015 the US will provide Ukraine with a 3 billion dollar loan guarantee. NATO placing permanent troops and military assets in Eastern Europe. US and coalition forces are preparing an event to take out Assad. Rumors today about a Greek deal almost completed but it seems that it was just that rumors. Lew stated that Greece has not achieved enough progress to solve the issue. He also noted that if there is a crisis in Greece prompted by a breakdown in the talks, the country will bear the brunt of the negative consequences. Throughout the first four and a half months of 2008, stocks moved up and down in a fairly narrow range, and the Dow closed at a short-term peak of 13,028.16 on May 19th. From there it was all downhill for the rest of the year. 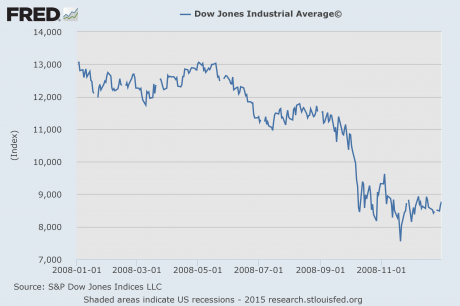 So will a similar thing happen in 2015 as we approach the next great financial crisis? Since March 20th, the Dow Jones Transportation Average has already fallen by almost 800 points. According to an evaluation of the Bank for International Settlements, the real effective exchange rate of the yuan has risen in the last five years by 33 percent. The IMF declaration is a surprising blow to the dollar as the yuan now can become a likely part of the IMF’s currency basket. With this move, China would be closer to its goal: to establish the yuan as a world currency and, thus, to break the dominance of the dollar in the long run. Supreme Court ruling, the judges from the 5th U.S. Circuit Court of Appeals in New Orleans ruled that Obama’s executive action should remain on hold pending further judicial proceedings. The decision further delays Obama’s immigration order, which was first blocked by a Brownsville, Texas lower court judge in February. In a statement, Ken Paxton, the attorney general of Texas, said Mr. Obama had tried to impose “a drastic change in immigration policy” without the consent of Congress. While pro-surveillance senators are continuing to appear optimistic on the last minute Sunday vote on the Patriot Act Section 215 renewal, there appears to be little reason for them to be so hopeful. They seem to be resting on the idea that White House support and the close deadline will scare a few votes over to their side, but major opposition from Sens. Rand Paul (R – KY) and Ron Wyden (D – OR) doesn’t seem to have changed, nor is there any indication of anyone else coming on board. Sen. Rand Paul said Obama was being “disingenuous” and could end the program himself. Sen. Paul, a Kentucky Republican, said that because much of the NSA’s sweeping authority was cemented under an executive order, Obama could act alone to repeal the agency’s power. The new Conservative majority government will bring into force far-reaching snooping powers that are potentially more invasive then previously feared, causing deep concern among privacy campaigners. The extension of powers will come as a surprise to many, as will the speed with which they are being brought into effect. Open Rights Group Director Jim Killock told the Guardian: “The government is signaling that it wants to press ahead with increased powers of data collection and retention for the police and GCHQ, spying on everyone, whether suspected of a crime or not. “This is the return of the ‘snooper’s charter,’ even as the ability to collect and retain data gets less and less workable. “We should expect attacks on encryption, which protects all our security. When asked about other plans of the Macedonian government on gas supplies and energy security, the prime minister said that the authorities were considering three other sources of the “blue fuel” supplies. Macedonia plans to receive liquefied natural gas from the port of Athens, to connect to the Trans-Adriatic pipeline (TAP) from Azerbaijan via Greece, and also to receive gas through the gas grid interconnector between Bulgaria, Romania and Turkey. Imports reached $1.608 billion, compared to $4.031 billion in January-April last year. The Ukrainian Cabinet of Ministers on Wednesday signed a decree on issuing eurobonds under a US-backed guarantee of $1 billion with a 2.5 percent interest rate, according to the Cabinet Members’ website. The strategy envisions the creation of conditions for successful European integration and accession to NATO. NATO’s enhanced readiness and military presence among partner countries bordering Russia is underway, Stoltenberg explained. Stoltenberg refused to confirm whether he discussed permanent NATO presence in Eastern Europe with President Obama. The Israeli military has launched airstrikes on what it called the “terror infrastructure” in Gaza, following an earlier rocket attack on Israeli territory which the IDF blames on Hamas. Gunmen tried to assassinate Libya’s internationally-recognised prime minister on his way to the airport in the eastern city of Tobruk on Tuesday. He did not elaborate but his cabinet said in a statement the gunmen had been “paid criminals” who had previously tried to storm parliament. In nine months of US and coalition airstrikes against ISIS targets in Syria, thousands of people have been killed, including hundreds of civilians. They’ve destroyed granaries and private oil platforms, and had multiple incidents of large civilian tolls. These reports are coming out across myriad sources, including independent monitors, but are repeatedly denied by Pentagon officials. They deny not only the numbers, but any deaths at all, . The French top diplomat added that Syrian President Bashar Assad had lost control of his country and his government is on the verge of falling apart. The two sides discussed enhancing joint cooperation to increase the trade exchange volume as the Algerian market needs Syrian products, particularly textile products, foodstuffs and medicines. They affirmed that enhancing trade exchange will yield common benefit for Syria and Algeria, stressing the necessity of reestablishing the Syrian-Algerian Joint Business Council which is considered an effective tool for promoting joint cooperation between the two countries. *IRS’S KOSKINEN SAYS THERE WAS UNAUTHORIZED ACCESS FEB-MAY. Old tax returns were stolen, was someone looking for dirt on a politician, judge etc. Was this done to push the CISA bill. US is reporting “heightened chatter” and urged that precautions be taken. Corporate media and US warns against people asking “unusual questions” about building maintenance or security procedures. What’s unique about the case is not that a corporation paid off-duty officers to protect oil and gas infrastructure — a common but rarely acknowledged practice — but that a document indicates that the explicit purpose of the police presence was to stymie dissent.